Alice may be the next Willy Wonka. I’m excited! I think I may have just found the next book we’re going to read aloud. It’s Alice’s Adventures in Wonderland, by Lewis Carroll. Here’s why. Tim Burton is directing a movie of the classic, which will star Johnny Depp as the Mad Hatter, Helena Bonham Carter as the Red Queen and Anne Hathaway as the White Queen. Anyway, this has the potential to be as big in our house as Charlie and the Chocolate Factory, and that’s saying something! The movie’s not due out until 2010, so that gives us some time to read the book and get ready for the movie. Alice is being played by Mia Wasikowska, but I’m not familiar with her so I’m putting her in the fine print only. I’m sure we’ll soon come to know and love her, though – Alice is a pretty great role. 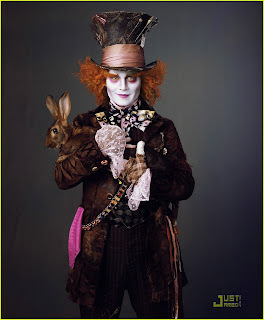 I borrowed this amazing picture of Johnny Depp from JustJared.com, a trend-spotting, pop culture-y kind of blog.